"Rockliff and Bruno (Mesmerized) reunite for another spectacular book." and this one is sure to please readers, young and old." 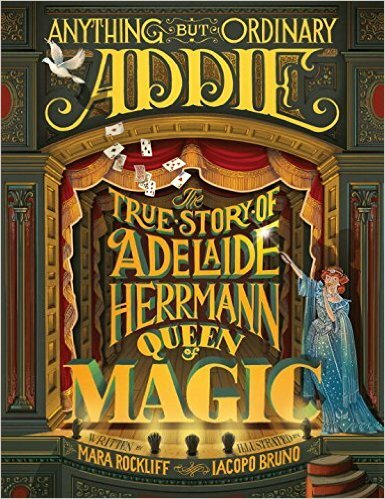 Be astonished and dazzled by the true story of Adelaide Herrmann, Queen of Magic! Some girls are perfectly happy never doing anything out of the ordinary. But not Addie—she longed for thrills and excitement! In an era when the stage was no place for proper young ladies, Addie dared to be a ballerina—and then gave it up for even more daring bicycle tricks! When she married world-famous magician Herrmann the Great, she knew she just had to be part of his show. Addie wanted to SHOCK and DAZZLE! She would do anything to draw crowds, even letting herself be shot out of a cannon. When Herrmann the Great died, Adelaide Herrmann felt she couldn't disappoint her loyal fans—the show must go on. But what could she do? She would perform the show all by herself! From the creators of Mesmerized, this rollicking romp tells the true story of one fearless magician's rise to glory, featuring the exquisitely lavish illustrations of Iacopo Bruno.